Well, I have brought my adorable chowling home. Leo is potty trained (or we are) and doing great. I also post on another board and people keep going on about "I have never seen a brindle Chow before". I keep telling them that he will be red as an adult, but someone posted on there that I HAVE to get him fixed and I could NEVER breed him because he is flawed and the product of a poor bloodline. Supposedly this came from Sarah somebody, a well known Chow Chow breeder. Does this sound right to you? I was planning on haveing him neutered, but this just got my fur up!!! I don't know how to post pictures on here, but I will try! I agree with Jsnider. i have a 14 year old chow that is 65lbs and NOT fixed. he is the best behaved dog i have ever had, and i was told it was a "killer, baby eater, bad tempered , even evil breed." well, glad i got him anyways... he is my baby and has never disappointed me. i have a problem with some breeders. i got Kahn because the "Breeder" was going to put him down cause of his ears... they fold over instead of standing straight up.. so, since he was "deformed" needed to be put down to save the gene pool... BAH, that really erks me. wish i had a digital to share pics.... good luck with your Pup. We saw an Akita that we thought was part Chow. The lady told us that it was an Akita even though it had the long hair, etc. She said that it was rare to see these types because most breeders will destroy them because they are considered a flaw. So it is quite possible that as far as breeding show dogs, a brindle Chow Chow would not be acceptable. Since you are not going to be breeding, then I don't think you should worry about it. I think some breeders are very adament about keeing the bloodlines clean and a "whoops" pup are put down to make sure those characteristics are removed from being further produced. Your brindle Chow is beautiful! I love those colors! the last post was from me...sometimes I forget to log in. Frankly, I think Leo is absolutely adorable! I learned a long time ago that some people 'just don't get it' and feel the need to tell you what to do and how to do it in spite of the fact that you are an adult. I've never seen a brindle chow, but they ARE CUTIE PIES!!! Maybe I'm mistaken, but the one on Dogster looks like a Chocolate colored Chow. They might not be "show quality" but I'd gladly adopt one if I ever saw one in real life So would a lot of people! That is so funny. I just met a lady tonight when we brought Leo to Petco that said she used to breed & show Chows. I asked her what color she thought he would be and she said Chocolate! I have never heard of a chocolate chow before, but that is now twice in one night!!! First of all, I want to tell you that I think Leo is really cute - I'm amazed at that color. He's going to be an great looking adult too, I am sure. I went and read all the posts in the other forum. I want to add my own comments and I hope that you understand I'm not trying to downplay how wonderful your pup is in ANY way! I've been "in chows" for nearly 14 years now, and do a lot of performance events with my chows. Currently I also show my pup in conformation. I've never seen or heard of brindle or chocolate chows. The AKC recognizes five colors only: red, black, blue, cinnamon and cream. People breeding for show quality pups only breed for those colors, so a brindle would not be acceptable in any way as far as showing goes. I realize that you weren't going to show anyway and that Leo is one of your furkids and not a show prospect - just wanted to clarify that in case any confusion happened throughout the other posts. In all honesty, Leo doesn't look like a purebred chow to me. I'm not saying he ISN'T, but I have seen long-coated akitas who look JUST like that and akitas can and do have the brindle color. I have a training friend with a long-haired akita who looks like a chow/akita mix (we fondly call him a "chiquita" .. *L*). He's a full-blooded akita though. Gorgeous dog, much bigger and taller than a chow. I'm not up on the genetics of coat color, but those breeders who are can tell you exactly what can be produced from breeding cream to black (I believe you said those were the colors of the parents). There are specific genes for each color, and breeding one color to another has a predictable outcome. A brindle chow isn't a predictable outcome though! *L* I have no idea how they ended up with that coloring, but what it does tell me is that either another dog is in the mix, or that they are breeding lines that shouldn't be bred together. 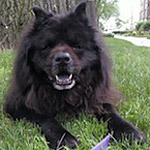 Breeding for the "off" colors weakens the pigmentation overall in chows and can, if continued to be bred, actually produce dogs that no longer have the black pigmentation in the mouth. Breedings like this may produce pet quality puppies, but there are tons of pet quality puppies put to sleep daily because there already aren't enough homes for the ones out there. Serious, responsible breeders don't breed unless they're trying to produce the best quality possible. This is probably what set off some of the people in the other forum. Anyone who is really serious about the good of the breed overall, breeds only for top quality pups. Brindles and other off-colors can lead to more problems down the line. It's not important for YOU, however, since you've already said you plan to neuter him. Regardless of how/why Leo was produced, I'm glad you have him and I hope you will keep us all updated on how he does. I imagine he'll be a wonderful companion! He's really adorable and I think the color is cute and certainly unique. Best of luck with him. Leo is purebred. I have his pedigree. I don't know exactly how to read it (I don't know any Chow lines or anything) but all the dogs listed on both sides are pure. My friends got his daddy from here in Alaska and his momma from somewhere in the lower 48. I appreciate your taking the time to answer me. I have never heard of a Chocolate Chow either, but I also read that there was no such thing as a brindle chow. The link that Aims sent shows a chow (purebred) that is a beautiful "chocolate" color. I honestly don't know what color Leo will be when he grows up (I was brushing him and he actually has stripes! Red & Black) but we love him and he is all chow! Here is a question. What do you all feed your chows? Leo will not eat! I researched dog food, found the best quality for the least money and he won't eat. I have now tried a new one, and he won't eat that either. He seems to like fish (I know this because he won't stay out of the cat's wet food!) He likes wet foods better then dry, but not enough for me to only feed him wet. Any suggestions? Hey Leo is the cutest puppy and color I have seen. He looks just like Avis when I first got her (cept for the color). Even though I had her pedigree, I wasn't sure about her being purebreed because her eyes weren't slanted and she wasn't "poofy". Now, she is starting to really fluff out (with daily brushing) and her face is starting to grow the creases that give the scowl. From what I have read, colors make no difference about temperament of a dog and Leo may change. I think, just like people that you can have a puppy that was "just born that way". I have a friend who is white with red hair and her brother, mother, father, and all of her family is black. She looks just like everyone (facial features, etc. ), but you couldn't tell. And I wouldn't say she isn't purebreed! 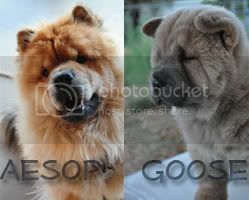 http://www.hoobly.com/bmWRK/brindle-chow-chows.htm I have found this chow, that looks so similar to yours I was thinking it was the same one haha! Very cute baby. I don`t know how they turn out brindle, as I have never seen or heard of it until today actually with these pictures. But if anything, they`re either like 90% chow with a slight mix? But I can`t imagine really what causes this! very interesting, and maybe they`re just black/brown colored. Who knows! No, the chow in the pictures she posted is definitely a brindle. I recognize the markings from my own. You can see the color swirls on him. He looks like a Merle to me. AKC doesn't recognize Merles, but I don't hold the AKC in such high regard anyway. Their 'standards' have really hurt this breed and a lot of others as far as I'm concerned, so I wouldn't worry about whether Leo's color is officially recognized by them. Whatever his color may be, he is adorable and if he is healthy and happy, that's all that matters. And, he does look purebred to me. I'm with Crumpet. Phooey on the AKC. He is BEAUTIFUL!!! I just have to add that Leo is so HANDSOME!!! Just to clarify, the AKC does not come up with the standards...the national breed club does. If you have issue with a standard, the Chow club would be the place to start, rather than vilifying a simple registration body. Becoming involved with the breed is the best way to have your voice heard. That said, I have never heard of the brindle gene being in the breed. Contrary to what some might think, random color patterns don't just appear willy nilly out of nowhere. What did your breeder have to say about the color? What color were the parents? 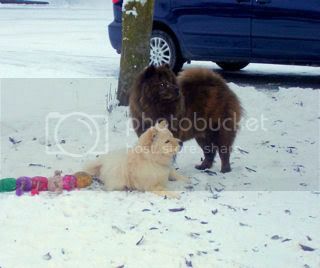 please read of how you get Brindle Chows from this link: http://www.xin-feng.nl/en/521e-dogcolor.html .. I also have a brindle chow and just because AKC does not recognize the color does not make him not a purebred...color variations and variations as a whole happen all the time...after all that is why we have how many different breeds. If it was not for people breeding outside the "standard" we all would still have wolves. Last edited by cuz117 on Mon Mar 09, 2015 6:06 am, edited 1 time in total. My dog Grizzly is brindle. He’s my miniature grizzly bear.